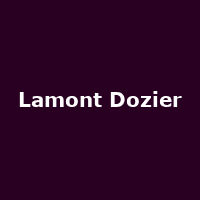 Lamont Dozier is an American songwriter and producer who, along with Brian Holland and Edward Holland Jr. formed the successful song-writing trio 'Lamont-Dozier-Holland'. The songs this trio produced went on to top the charts all over the globe, with hits including: 'This Old Heart of Mine', 'Baby Love', 'How Sweet It Is (To Be Loved by You)', 'Stop! In the Name of Love', 'Reach Out I'll Be There' and 'You Keep Me Hangin' On', to name but a few. Their songs were originally recorded by Motown greats Marvin Gaye, The Supremes, The Four Tops, Martha and the Vandellas and more, with numerous cover versions over the decades.